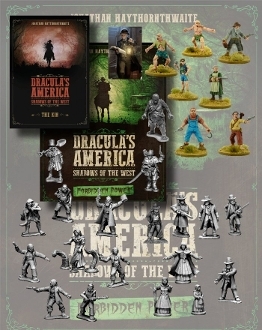 The Forbidden Power Level 4 Nickstarter is for the Dracula's America collector who wants all the new stuff. The deal includes the supplement 'Forbidden Power, the Salem Sisterhood Posse, the Church of Dagon Posse, the Kin Posse, the Investigator, the Bounty Hunter and the Gravedigger. It also includes the unique Nickstarter item, the Posse sheet for 'The Kin'. This Posse does not feature in any of the books and was written by the author especially for the Nickstarter. This level 4 Nickstarter also qualifies you for all the Nickstarter rewards as they are unlocked.